As I get further along in this pregnancy, I am needing to find new combinations of foods to eat to keep me going throughout the day. I came across this picture on Fitfluential’s facebook page and thought I would post about it. 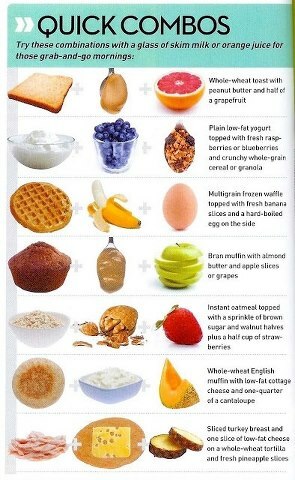 What’s your favourite breakfast combo ? I’ve been digging craving Raisin Bran with skim milk for weeks now but every so often I change it up. Yogurt, granola and berries etc. Does working out make you eat more ? What food combo’s give you the energy boots you need? what was your weirdest combination of foods (breakfast or not)? I’d love to hear about it in the comments below ….